The trick with making them here in the states, however, is to find the right dough, so Kathrin and I drove to the local German delicatessen to find the brand she likes best, called Henglein Seidenknödel. 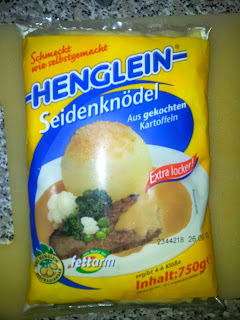 These are powder mixes, which Kathrin didn't think would taste as good as the fresh dough in the Henglein package. But we forged ahead, with all four kids blending, mixing, and ball-rolling. The rolled Klöße are placed in a pot of boiling salt water but should be immediately removed from heat and allowed to just gently simmer for 20 minutes. We made the Klöße as a scrumptious side dish to Geschnetzeltes, sliced pork tenderloin with fresh mushrooms in a cream sauce. The meal was enjoyed by all and the kids were very proud to have taken part in the cooking, of course. Of the two varieties of Knödel in the packages we bought, we thought the bayrisch, not the halb & halb, tasted a little bit better, but overall Kathrin still prefers the Henglein fresh dough she buys at home in Germany. I've got to try that recipe!